Nephrite consists o a microcrystalline interlockin fibrous matrix o the calcium, magnesium-iron rich amphibole mineral series tremolite (calcium-magnesium)-ferroactinolite (calcium-magnesium-iron). The middle member o this series wi an intermediate composeetion is cried actinolite (the silky fibrous mineral furm is ane form o asbestos). The heicher the iron content the greener the colour. 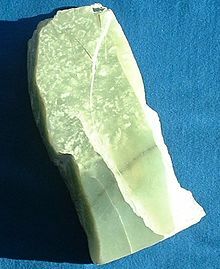 Jadeite is a sodium- an aluminium-rich pyroxene. The gem form o the mineral is a microcrystalline interlockin crystal matrix. This page wis last eeditit on 12 November 2013, at 14:14.